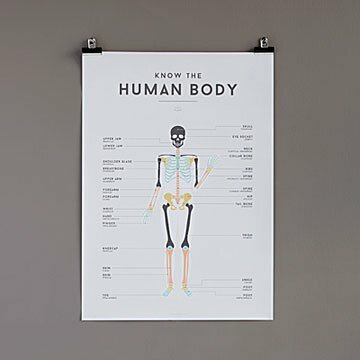 Help kids get a head start on anatomy, multiplication, or the ABCs with these illustrated posters. The wrist bone's connected to the hand bone. The dorsal vertebrae's connected to the, uh… The answer's in one of these delightful posters. Not only do they make creative decor for a kid's room or playroom, they're also educational. Each features a simple design that makes learning fun, from a basic anatomy lesson to times tables to the alphabet. They even come with binder-style clips—think oversized versions of what you used to hold your book reports together—for hanging. Just add a couple of nails and your wall of knowledge is in the works. Made in Australia.